The article is of particular interest as my wife grew up only one street away from Oakfield Road, Clifton, Bristol. Mrs Walter of Clifton offered a discreet service to Victorian parents – she disciplined their children to avoid them having to do it. Campaigners who have succeeded in having the beating of children outlawed in Britain would have loved Mrs Walter. 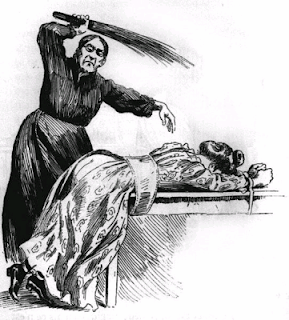 She offered a very special service to sensitive parents who felt their girls needed a good thrashing but didn’t like to do it themselves a Victorian “Dial-a-Birch” in fact. Mrs Walter operated at 53 Oakfield Road, Clifton, and advertised her respectable chastising service for unruly daughters in the national papers. One advertisement read: ‘Bad temper, hysteria, idleness etc. cured by strict disciple and careful training”. Another claimed ‘Intractable Girls trained and educated. Excellent references. ‘Hints on Management’, Training of Children’ and ‘The Rod’ is each. Advice by letter, 5-shillings. Mrs Walter, Clifton’. This was a bizarre enough idea, even by Victorian standards, for a bit of investigative reporting, and a magazine called Truth sent along some undercover agents. One of them, a woman, explained she had an unruly daughter she wanted “broken in”. Mrs Walter offered to take the mythical unruly daughter for £100 a year and presented impressive references from the Dean of Lincoln, an admiral, a general, and a number of lords and ladies. Her guiding rule, she claimed was ‘Never birch when angry’. She also revealed that she offered a travelling chastisement service as far away as London. If she was called up specially, she charged two and a half guineas: if she was already in London, the fee was 10s 6p. The Truth team described her as a tall, strong woman, dressed like a nurse and wearing a Good Shepherd medallion, who was quite happy to describe her methods to curious parents. She had a strong narrow table, straps for waist, wrists and ankle and a long pliable birch rod. The hapless victim had to take off her dress, knickers and corset and put on a dressing gown back to front a bit like those embarrassing hospital gowns and was quickly strapped down. ‘Taking the birch, I measure my distance, and standing at the side, I proceed to strike slowly but firmly’ Mrs Walter explained. ‘By moving gently forward, each stroke is differently placed and six strokes may well be enough if given with full force. If the fault has been such as to need severe correction, then I begin on the other side and work back again. For screams, increased strokes must be given. If a girl tries very hard to bear it bravely, then perhaps I give 10 instead of 12’. Remember that this was not a flagellation brothel but a respectable establishment in a high class residential district and widely advertised, recommended and used. Even so, ‘Mrs Walter’ was not quite what she seemed. Truth discovered she was really Mrs Walter Smith, widow of the clergyman headmaster of All Saints School, Clifton, and she was so busy that she charged half a guinea just for an interview. When her husband died, she set up a girls’ school of her own and it was for this that the dean and other VIPs had given references. No one had told them that Mrs Smith had quietly changed bits purpose to a house of chastisement fir difficult girls and they were aghast when Truth published its finding. Mrs Smith suddenly found her establishment had lost all its big name supporters. The controversy over her activities filled the Bristol and Clifton newspapers’ letters columns for some weeks and Mrs Clapp, Mrs Smith’s birch supplier in St John’s Road (‘from a family who have made them for generations’) panicked and denied ever selling them It didn’t help her cause that she had been advertising them for sale in the Church Times, of all places, six months earlier. What happened to Mrs Smith? Did she carry on with her useful service for sensitive parents, or did she retire? Whatever happened to her, her story survives in numerous books as an example of the hypocritical and cruel underside of Victorian society.